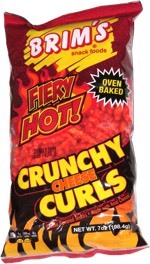 Taste test: These chips were great all around. They had a wiggly, irregular kettle-cooked shape and texture, with many of the chips folded onto themselves. 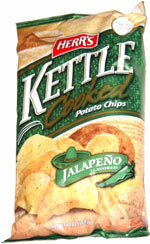 There was a very nice, brittle crunch, a high level of crispness, and an intense jalapeño and potato taste. The flavor had a moderately high level of heat, not a run-for-water-now heat, but it was very, very tasty. Welcome to the kettle-cooked chips club, Herr's! Smell test: Smells like when you open a jar of jalapeños, but not really a hot smell.